Using PopMessenger you can assign users to custom groups. Groups can be based on enterprise departments, user interests, communication preference component etc. User groups can be used to represent of your company structure visually. To create a group one should right-click a group name or the blank space in the users list. The context menu will then appear. Select the 'Create new group' menu item. The new group will be named 'New Group 0'. Now you can change the group name to something more informative. How do I move a user to the group? For example, you have created the group named 'Sales Dept'. To move a user to this group right-click his nickname and then select 'Move user to a group...' from the context menu that appears. The 'Move User' dialog window will appear. 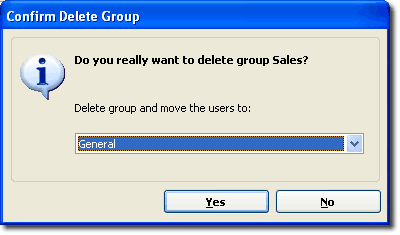 Select a group and press the 'Yes' button. How do I add a user to multiple groups? 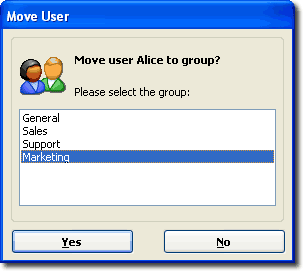 If you would like to add one user to multiple groups, you can do it by the same manner as the moving a user. Right-click a nickname and then select 'Add user to a group...' from the context menu that appears. The 'Add User' dialog window will appear. Select a group and click the 'Ok' button. We have created the 'Sales Dept' group and moved users to it. If you would like to send an announcement to all members of this group, right-click the group name and select 'Send message to group' from the context menu that appears. You can even select an individual user from this group who will receive your message. You can hide or show users of a group by double-clicking the group name. The [ ] sign means that the group tree is expanded and users are shown. The [ ] sign means that group tree is collapsed and users are hidden. To disable groups open the 'Options' dialog window and uncheck the 'Enable user groups' option on the 'General Settings' tab. To rename a group right-click the group name and then select 'Rename group' from the context menu that appears. Confirm the new name by pressing [Enter] on your keyboard. » How to send a chat message? » How to send private message? » How to send broadcast message? » What is the Offline Message? » What is the Messages History? » How to save and print History's entries?